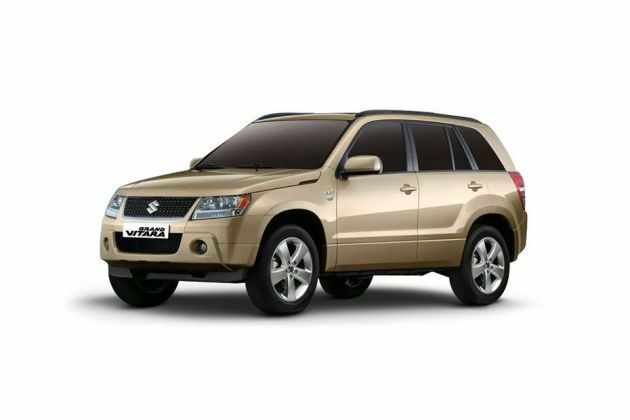 Grand Vitara from MSIL is one of their premium SUV offering that is available only with a petrol engine option. Its entry level trim named Maruti Grand Vitara 2.4 MT is equipped with a 2.4-litre petrol engine that is based on a DOHC valve configuration. It generates a maximum power of 163.5bhp in combination with torque of 225Nm. The company has offered it with a large fuel tank that can hold about 66 litres of petrol in it. Built with a total length of 4500mm, this variant has a ground clearance of 200mm and a wheelbase of 2640mm. Its outer appearance is decent yet appealing with a perforated radiator grille and a well designed bumper that are hard to ignore. Its attractive side profile includes a set of aluminum alloy wheels and door mirrors that are electrically adjustable. Its rear end has body colored tailgate handle, window demister and a bright tail lamp cluster. Its interiors have a power steering system, automatic climate control, center room light, foot rest, reclining rear seat, and many other such functions, which add to the style as well as comfort quotients. Apart from all these, it includes ABS with EBD, immobilizer, seat belts and dead locks that helps in offering maximum protection to its occupants. To begin with its front fascia, it has a big windscreen that is integrated with a couple of intermittent wipers, which have a 2-speed setting. The bumper is in body color and fitted with an air intake section as well as a pair of fog lamps. Just above this is a headlight cluster, which is equipped with multi reflector plus halogen projector headlamps that have leveling function. Then, there is a perforated radiator grille with the company's insignia engraved in its center. The aspects like body colored door handles, outside rear view mirrors and B-pillars are available in its side profile. Its neatly carved wheel arches are equipped with a set of 17 inch aluminum alloy wheels that are further covered with 225/65 R17 sized tubeless tyres. On the other hand, its rear end features a windshield with demister and a high mounted stop lamp, while the bumper has a couple of fog lamps fitted to it. The tail lamps come along with turn indicators and a spare wheel is also offered with a cover having 'SUZUKI' lettering on it. This base variant has a roomy cabin that accommodates five people with ease. It is loaded with sophisticated features of which, a few are garnished with silver like door opener, gear shift knob, and side louver bezel. Its well cushioned seats are covered with rich fabric upholstery and integrated with headrests. The driver's seat has height adjustment facility, while the reclining rear seat has 60:40 split folding function. The multi information display displays average speed, low fuel warning, door ajar, outside temperature, cruising range and a few other notifications. A number of utility based aspects are available inside like pockets on door trims, front seat back pockets, cup and bottle holders, assist grips and coat hooks as well. On the dashboard, it includes a three spoke urethane steering wheel, air vents, center console fitted with an AC unit and a glove box for keeping necessary things at hand. Besides these, the cabin also features front map light, driver's side foot rest, floor console with storage compartment, tachometer, luggage room shelf, as well as 12V accessory sockets in center console and luggage areas. It is fitted with a 2.4-litre petrol engine that has a displacement capacity of 2393cc. This VVT mill carries 4-cylinders, sixteen valves and is based on a double overhead camshaft valve configuration. Petrol is distributed to this motor by way of a multi point fuel injection system and is coupled with a five speed manual transmission gear box. It can churn out a peak power of 163.5bhp at 6000rpm and generates torque output of 225Nm at 4000rpm. This power plant helps in attaining a top speed of around 190 Kmph and in accelerating from 0 to 100 Kmph in nearly 9 seconds. The automaker has fitted both its front and rear wheels with disc brakes. It is further accompanied by anti lock braking system along with electronic brake force distribution. In terms of suspension, a McPherson strut is assembled on its front axle and a multi link is used for the rear one. This trim comes with a rack and pinion based power assisted hydraulic steering system. It provides very good and quick response besides making maneuverability easy to the driver. Moreover, it also supports a minimum turning radius of 5.5 meters. In terms of comfort, it includes a power steering system that has tilt adjustment function. The air conditioning unit comes with a pollen filter and features automatic climate control as well. The driver's side sunvisor includes a ticket holder, while the one on front passenger's side has a vanity mirror in it. For the best in car entertainment, it includes an audio unit that has 6-CD in dash with MP3 player, subwoofer, two tweeters and four speakers as well. There are front and rear power operated windows with auto down function on the driver's side. Other than these, the list also includes a speedometer, digital audio display with clock, steering wheel mounted illuminated audio controls, remote fuel lid opener, rear seat center armrest, sun shade print on front windshield and a few others. On the safety front, it has dual front SRS airbags, head impact protection structure, child proof locks on rear doors, high mount stop lamp, foot protection design for brake pedal, and door ajar warning lamp. In addition to these, it also includes driver's seat belt warning, engine immobilizer, ABS with EBD and brake assist, front and rear side impact beams, as well as three point ELR seat belts with pretensioner and force limiter at front. 2. Several comfort features are offered. 1. Safety standards can be further improved.